West Ham United striker Javier Hernandez is enjoying life at the club under new manager Manuel Pellegrini, and feels results will soon improve. The Hammers have endured a tough start to the new Premier League season, suffering defeat in all three of their games so far this term. 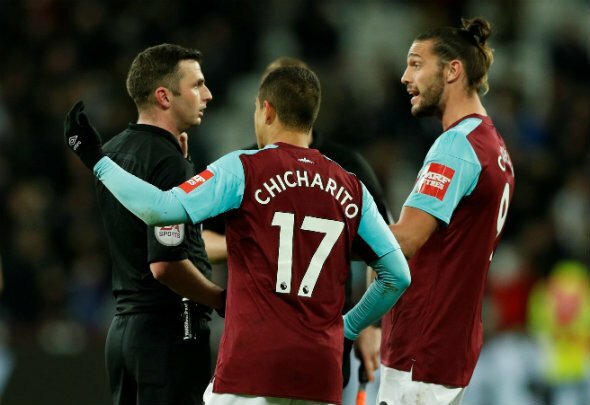 Hernandez, on a reported £140k-a-week, is undeterred, however: “We are playing with a winning mentality and playing very offensive and attacking football,” he told the club’s official programme. “That’s what the manager loves and, talking about myself as a striker, I love it when a manager comes and creates that sort of atmosphere, telling every player to be confident with the ball. All the noises coming from the West Ham camp suggest that the team aren’t far away from clicking; that the transformation under Pellegrini is just around the corner. That may or not be true, but only time will tell. The team need to prove themselves on the pitch, and that starts with their game against Wolves at the London Stadium on Saturday. It’s too early in the season for this to be a must win game, but the Hammers really need to get off the ground in the Premier League this term. Losses to Liverpool and Arsenal can be excused, but if they succumb to Wolves in the way they did against Bournemouth, something’s really wrong. There’s more than enough talent in this team, with the likes of Hernandez, Marko Arnautovic and Felipe Anderson, for them to mount a serious assault on a seventh place finish. However, they’re in danger of cutting themselves adrift in the race to be best of the rest. Let’s see if Hernandez’s positive words produce a positive result on game day.